Fortunately there are places where you can find lists of companies that have proven to be scams or at least that are very likely to be such, based on reports from users that have tried them out or have done some research. 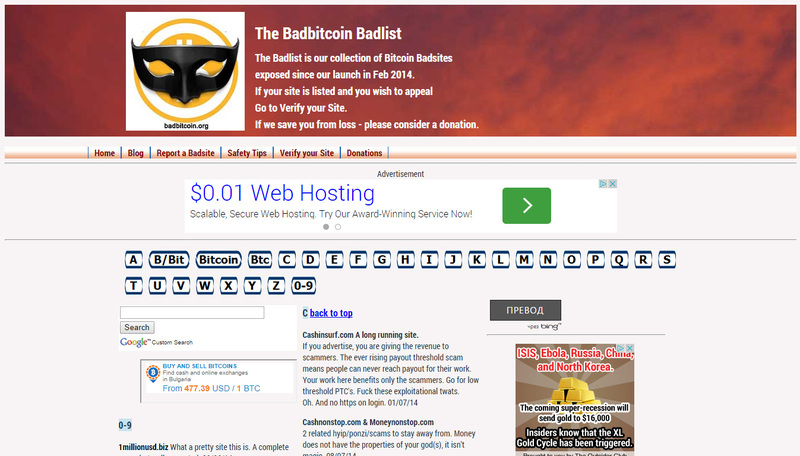 Websites such as Badbitcoin for example offer you a quick and easy way to check if a new crypto currency website that you just found out about is legit or might be a scam. If you see the website in question listed as one to avoid or with high chance that it might be a scam, then you better avoid it just to be on the safe side. We have said that sometimes there are websites that may seem like a scam, mostly due to the operators willing to remain anonymous, but then turn out to be safe and deliver on what they are promising… these however are rare to find. There are also examples of the opposite as well – an open and honest-looking service that operates and delivers on their normal and not exaggerated promises for months suddenly turns out to be a scam, but these are also rare. Based on our own experience many of the scam sites are just going for a quick run of few weeks trying to mislead as many people as they can for a short period of time and then disappear with their money, though some scams do continue for months. This is precisely why it is a wise idea to do some research when money are involved and websites such as Badbitcoin and the lists of websites to avoid that they provide can be a useful part of your research.